Lemon Grass (Cymbopogon), is a species of perennial grass that make an effective ground cover, pest deterrent and bee attractor all in one. I consider it well worth having in the forest garden, but can it grow from a store bought cutting? 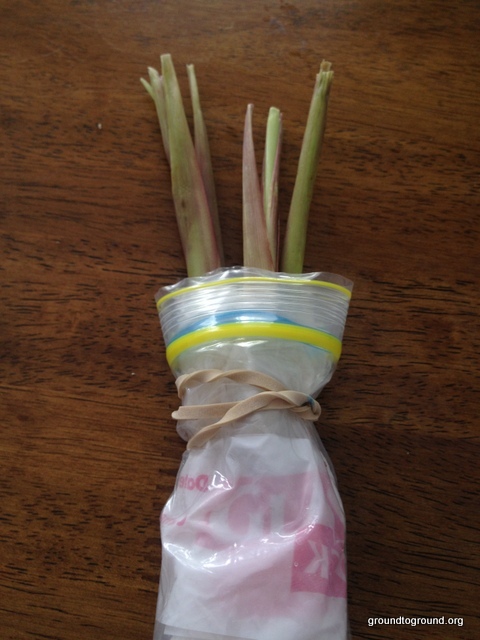 Now having done it (and excitingly waited to have enough proof to get this post published), growing Lemon grass is fairly easy to do from a single piece. 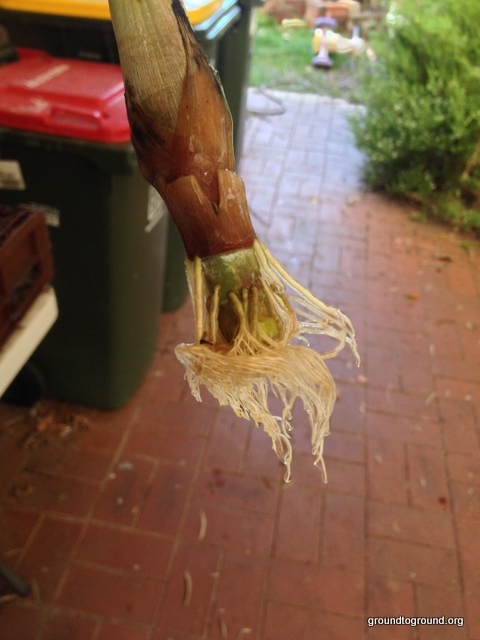 The example below is from a store bought stalk that had no roots attached. I sat it in a glass jar, half full of filtered water on the window sill over Winter and early Spring, and this is the result. 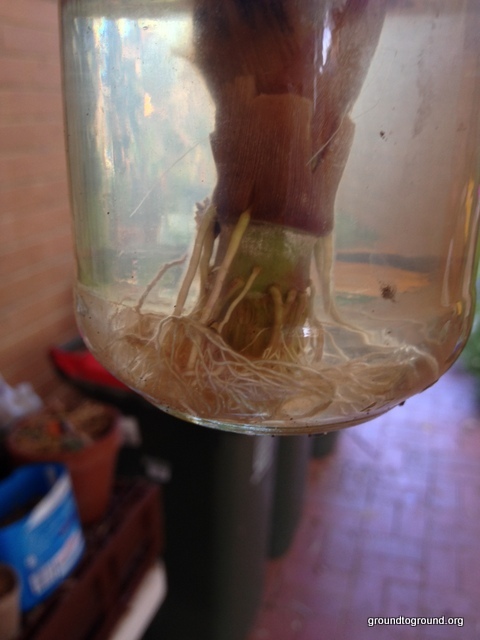 Took a couple of months to start growing roots so don’t be in too much of a rush – it will happen. Good strong root growth right out of the water and about to go into a pot. 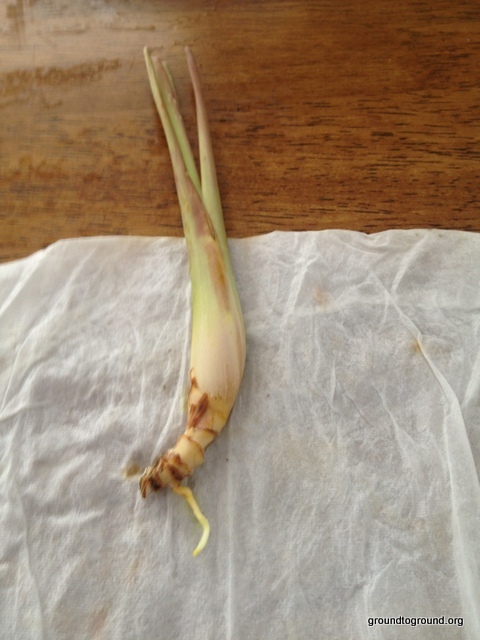 Here is an example of a lemon grass stalk with the root still attached. If you want to try and grow lemongrass, look for stalks that have any piece of root still attached, for potting straight into soil. Or if it needs more development – wrap in wet paper and keep warm and humid within a plastic baggie. OK so not so difficult, and worth the effort to do it for little cost at home. Get growing!! Tags: cutting, Cymbopogon, garden, lemongrass. Bookmark the permalink.